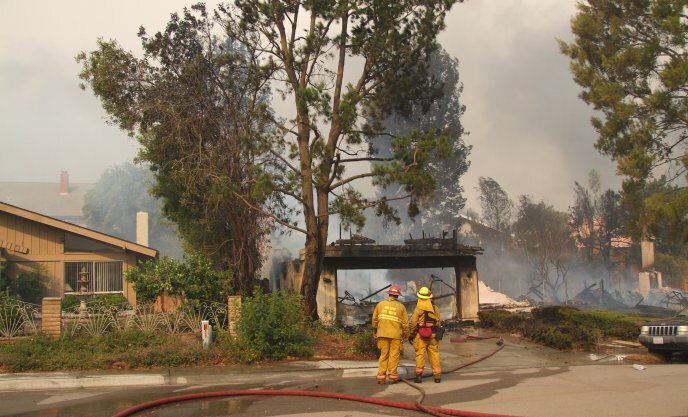 Go to www.sandiego.gov and click on the link List of Fire Damaged Homes and you see all the homes destroyed by fire in Rancho Bernardo alone yesterday. Each number under each street is a burned house, full of furniture, clothes, groceries, decorations, toys and all other possessions. I counted 301 houses destroyed. Each one a total loss for a family. And here it is just a number, so people that are evacuated and cannot come close to their neighborhood can see if their house is still standing. We made the decision to move a couple of weeks ago. The weekend before last we found the perfect place. We hit it off with the owner. He showed us the property. We looked over the fence to the neighbor’s property. The owner told us about the neighbors. We saw their kids playing on their skate boards in the cul-du-sac. A few days later we signed a lease. We were looking forward to moving in a few weeks. Then the San Diego Witch Creek Fire started on Sunday. By Monday, Rancho Bernardo was an inferno. There was no way in and out of the community. It was evacuated completely. Today, a day later, I checked the list above and found that the two homes directly next to us on the right burned down completely. I am stunned. Will we move into a property next door to two piles of smoking rubble? Is the house we’re moving into damaged? Partially destroyed? I don’t know yet. I will find out as soon as the police takes down the roadblocks and barriers, and we can get into the neighborhood. And I cannot fathom what it must be like to read your address on a list on the Internet and realize that your house and everything in it is gone. I cannot fathom how this is happening to more than 300 families in Rancho Bernardo alone. I cannot fathom how this is happening to many hundreds of families all over the rest of San Diego County and across Southern California. I am not even directly affected, but I am stunned and consumed by utter disbelief. I am very lucky. The picture below shows a different house, about a half a mile away, on the other side of I-15. On the left you can see the house of our friend Linda. It was spared. In the center you see what is left of the house of her neighbor. One flying ember may have made the difference. Glad to know you are OK. Like you, I cannot fathom what it must be like. It is good to read that you are OK. I can not know what it is like to be there, but your description helps. My father evacuated for a night, but is back home and fine. The fire never got to within a couple of miles of his house.